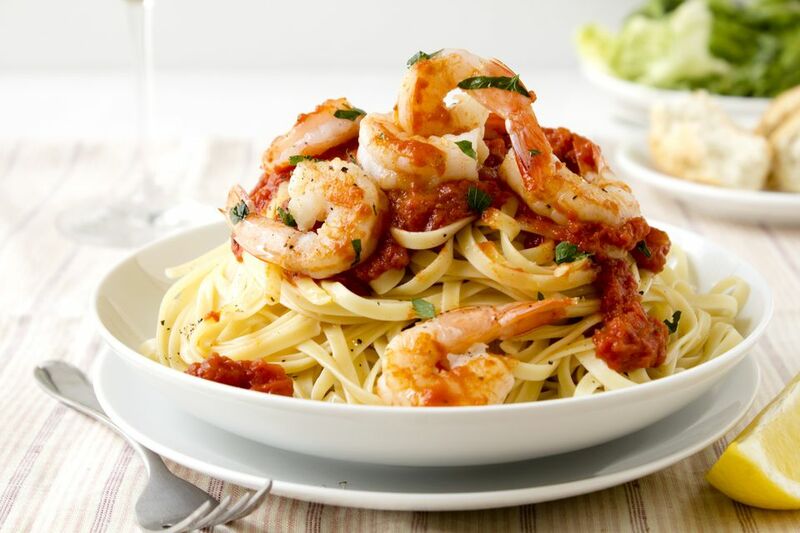 Shrimp Fra Diavolo is a classic, slightly spicy Italian dish (but feel free to kick up the spice with more red pepper flakes or a dash of cayenne pepper, if you wish). It's perfect for a weeknight dinner but fancy enough for company. It's also light enough to make great summer fare. Add a green salad and perhaps a bottle of Pinot Grigio, and you're eating like a queen, or maybe a Duchess. Cook pasta according to package directions to achieve a perfect al dente texture. Drain when done, reserving a couple of tablespoons of the cooking water. Meanwhile, toss the shrimp with the salt and pepper flakes. Heat the oil in a skillet over medium-high heat, add the shrimp, and cook for about 2 minutes per side. Remove from pan and set aside. Reduce heat to medium, add onion to skillet, and cook until soft and translucent - about 5 minutes. Add vermouth and reduce liquid to almost nothing. Add tomatoes and herbs to skillet and cook 10 minutes, then put in the shrimp, and reserved pasta water and cook another couple of minutes. Taste and adjust seasoning.